Don’t let heart-warming coverage of the Refugee Olympic Team distract from the other refugee crisis the IOC helped create. In an Olympics where “feel-good” narratives are few and far between, there is one storyline that journalists and Olympic lovers are clinging to like it’s a life raft in polluted Guanabara Bay. This is the tale of the first-ever All-Refugee Olympic team and, without question, their journeys are remarkable. These 10 athletes will march into the opening ceremonies on Friday under no nation’s flag. Instead, only the Olympic flag will be unfurled, and the 10 competitors—the youngest of whom is 13—will represent the exploding refugee population sprawling across the globe, currently estimated at more than 60 million people. 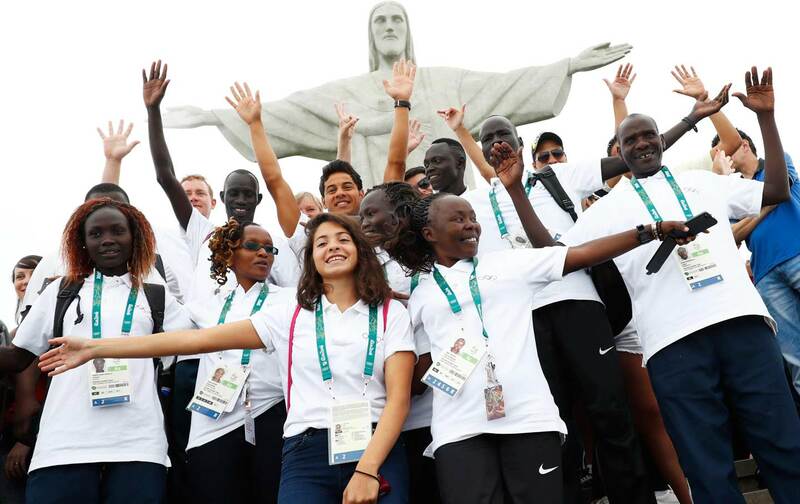 Upon their arrival to the Olympic village, they received a “rapturous welcome” and were mobbed by hundreds of other athletes. Expect a similar reaction when they walk out onto Maracanã Stadium for the opening ceremonies. These refugees have no home, no team, no flag, no national anthem. We will offer them a home in the Olympic Village together with all the athletes of the world. The Olympic anthem will be played in their honour and the Olympic flag will lead them into the Olympic Stadium. This will be a symbol of hope for all the refugees in our world, and will make the world better aware of the magnitude of this crisis. It is also a signal to the international community that refugees are our fellow human beings and are an enrichment to society. These refugee athletes will show the world that despite the unimaginable tragedies that they have faced, anyone can contribute to society through their talent, skills and strength of the human spirit. Thomas Bach is someone acutely aware that the Olympics are in trouble: Citizens in potential host cities have been vocal in wanting no part of the massive social disruption that the Olympics bring. One of the reasons listed by protesters from Boston to Krakow is that the arrival of the games invariably means displacement for poor and vulnerable residents. That displacement creates what the United Nations call an “internally displaced person” or IDP. Every Olympics creates IDPs, the high-water mark being the staggering 1.5 million in Beijing back in 2008. Whether in Atlanta or Seoul, the Olympics have been a place where people became homeless because of the demands of the IOC. Rio has had 77,000 people internally displaced since they were granted the Olympics in 2009. The most high-profile evictions went down mere yards from the Olympics in the community of Vila Autódromo, which only this week finished evicting the last holdouts. As I have met many of the families of Vila Autódromo who have faced down violence and heard their stories, I find that first line by Bach to be borderline obscene. Read it again: “These refugees have no home, no team, no flag, no national anthem. We will offer them a home in the Olympic Village.” A temporary home is offered for 10 people, while hundreds of families are displaced from their actual homes. The stories from Vila Autódromo may not inspire journalists in the same way, but they are no less harrowing: accounts of elderly people being threatened, doors knocked down by police with guns drawn, and neighbors severed from one another. It’s not a feel-good story, but the villagers’ bravery is no less a testament to the human spirit, and you better believe it is an Olympic story. We all have heard the phrases “greenwashing” when a company or government hostile to environmental issues puts up a phony front to win undeserved public support. I don’t know if “refugee-washing” is a word but maybe it should be.